Although refrigerators and freezers make it convenient to purchase fresh meat such as a steak and then store it for a period of time before consuming it, the longer your meat is stored the higher the chances are of it spoiling. Common causes of meat spoilage are mold, bacteria and exposure to air. It is sometimes difficult to tell if a steak is spoiled or not, but if anything about the smell or appearance of a piece of meat makes you question whether or not it is still good, throw it away. Do not risk making yourself or your family sick. Check the “use by” date on the steak’s packaging. This is an estimate of the date on which the meat will begin to decline in quality; if you are only one or two days past the date, the meat is most likely still fine for consumption. But if the date has long since passed, the meat is probably spoiled. Smell the steak. Raw meat that is spoiled will have a very distinctive, unpleasant odor. It may smell similar to sulfur or ammonia. If the meat smells unusual in any way, do not eat it. Look at the steak and touch it with a utensil such as a fork. Slime or stickiness on the surface of the meat is a sign of spoilage. 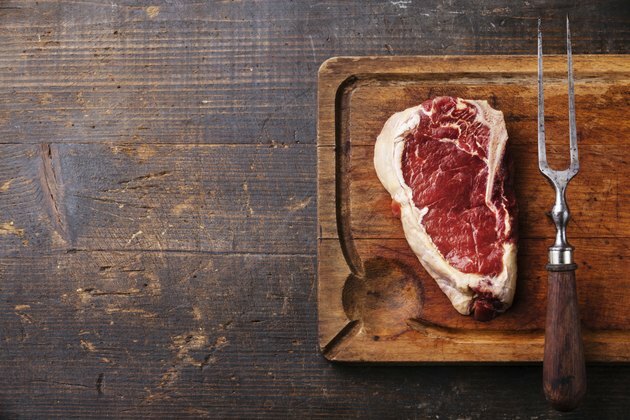 Appearance-wise, if the steak is an odd color such as brown, gray or green, or if it has patches of black or green discoloration or areas that have “whiskers,” these are the result of mold growth that makes the meat unsafe to eat. What Happens if You Cook Meat After It Has Gone Bad?